You may be in an indus­try that is so basic, so fun­da­men­tal, that the idea of a “next” prob­a­bly seems absurd. 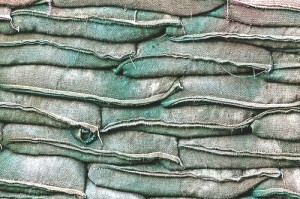 I’m not sure how many com­pa­nies make sand­bags, but there are lots of places that sell them. World­wide. Which makes sense: floods or over­flows can hap­pen any­where. And, as Wikipedia points out, sand­bags can be used for oth­er pur­pos­es: “A sand­bag (flood­bag) is a sack made of hessian/burlap, polypropy­lene or oth­er mate­ri­als that is filled with sand or soil and used for such pur­pos­es as flood con­trol, mil­i­tary for­ti­fi­ca­tion, shield­ing glass win­dows in war zones and bal­last. Advan­tages are that burlap and sand are inex­pen­sive, and that the bags can be brought in emp­ty and filled with local sand or soil” [link]. One source traces the sand­bag at least 250 years, to Napoleon’s time [link]. What if your com­pa­ny man­u­fac­tures sand­bags? I’ll bet that assem­bling a team of man­agers and work­ers in your com­pa­ny to work at nextsens­ing would seem to make lit­tle or no sense. Oth­er than man­ag­ing costs to keep your prices low, what have you to fear from any and all com­pe­ti­tion? Then again, maybe you should fear this 11-year-old from Flori­da. An 11-year-old boy from Flori­da has designed a new kind of sand­bag to bet­ter pro­tect life and prop­er­ty from the rav­ages of salt­wa­ter floods. His inven­tion took top hon­ors at a sci­ence fair this week, earn­ing him a $25,000 check and a trip to Cos­ta Rica. “Liv­ing in Flori­da, I’m keen­ly aware of hur­ri­canes and salt­wa­ter flood­ing,” the Dis­cov­ery Edu­ca­tion 3M Young Sci­en­tist Chal­lenge grand prize win­ner Pey­ton Robert­son, who is a sixth grad­er at the Pine Crest School in Ft. Laud­erdale, Fla., told NBC News. “Super-storm Sandy real­ly got me con­cerned about how peo­ple can pre­pare for that dam­age from flood­ing. But today, the most com­mon method of flood pro­tec­tion is sand­bags. They are real­ly heavy and dif­fi­cult to trans­port and leave gaps in between the bags. So, I redesigned the bag,” he explained. Instead of sand, his bag is filled with a mix­ture of salt and an expand­able poly­mer. When dry, it is light­weight, easy to move and easy to store. Once the bag is posi­tioned, such as to cre­ate a bar­ri­er around a house, users hose it down with water. The poly­mer absorbs the water, swells and fills the vol­ume of the bag. But the top young sci­en­tist in Amer­i­ca isn’t done. Adds NBC News: “The bags also have a nov­el inter­lock­ing mech­a­nism that con­nects them at their mid­points in order to pre­vent gaps that flood­wa­ters can pen­e­trate. Robert­son test­ed the bags in the bath­tub and a kid­die pool where they eas­i­ly out­per­formed tra­di­tion­al sand-filled sand­bags. He next hopes to test them ‘in a real hur­ri­cane sit­u­a­tion because that is the only way to fig­ure out what glitch­es or what­ev­er might be in the solu­tion’ ”. So, if you think your com­pa­ny doesn’t need a “next”, I urge you to think again. Hav­ing looked at many organ­i­sa­tions in many fields, I can assure you that some­one or some­thing is just wait­ing to snap and bite.